A yaodong (Chinese: 窰洞; pinyin: yáodòng) or "house cave" is a particular form of earth shelter dwelling common in the Loess Plateau in China's north. They are generally carved out of a hillside or excavated horizontally from a central "sunken courtyard". The earth that surrounds the indoor space serves as an effective insulator keeping the inside of the structure warm in cold seasons and cool in hot seasons. Consequently, very little heating is required in winter, and in summer, it is as cool as an air-conditioned room. The history of yaodongs goes back centuries, and they continue to be used. In 2006, an estimated 40 million people in northern China lived in yaodongs. In the last decade, yaodongs have been brought to the attention of scientists and researchers. These traditional dwellings have been regarded as an example of sustainable design. The landscape of the Loess Plateau terrain is very complicated with valleys, slopes, ridges, and monticules. In order to avoid the wind and utilize sunlight and water, most yaodongs are distributed along the sides of the cliffs and valleys to conform to the terrain, in principle, forming three types of Yaodong. Cliffside yaodongs are the most common among all types. People dig caves in the cliff on the edge of the loess slopes with the floor rectangular and the top arched. In front of the cave is an open space for lighting and ventilation, so that the user does not feel the space to be depressive. According to the number of cave holes, the yaodongs can be further classified into three-hole type, two-hole type, and single hole type. A typical example is the city of Yan'an. Those dug around an excavation conducted at the surface, serving as interior courtyard, called yaodong-well or sunken courtyard (photo cons). 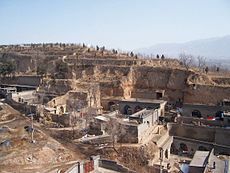 In the Loess Plateau, without hillsides and ravines available, peasants skillfully use loess's features (wall stability) to dig a square pit on the spot and then dig the cave horizontally on the four walls to form the underground courtyard. In most parts of western Henan, this form of caves is called the "pit yard”. Sunken yaodong has two types according to the form of entrance: slope-entrance and flat-entrance. Both are excavations of pits in the flat ground. First, if the yaodong is surrounded by flat ground, slope can be used for entering and leaving the pits. 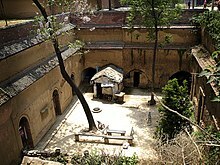 This is called the “dikenyuan” or the “ pit yard”. Second, if there is a cliff or a steep slope next to the yaodong, it can be used to excavate the corridor through the cliff or slope to reach the horizontal entrance of the courtyard. This type of Sunken yaodong, which is also called the well-courtyard or the well-yaodong, is the majority in the area. The Hoop yaogong, also called independent yaodong, is the most valuable type considering its construction techniques. In the traditional residential areas in western Henan, the Hoop Yaogongs appear in the places where there are no condition for excavations of cave dwellings, such as the loess layer is thin, the slopes are gentle, the height of the soil cliffs is insufficient, or the bedrock is exposed. A hoop yaodong is usually built wholly or partially outdoors, with an arched structure inspired by the underground dwellings. This arch-shaped form, not only reflects the Chinese traditional thinking of a Round sky and Square earth, more importantly, the high arch of the cave plus high windows allows the sun to further penetrate inside the cave in winter, therefore making full use of solar radiation. This new vaulted homes of this type are now common among farmers in the area. The first type of yaodong were underground dwellings that date back to the 2nd millennium BC, China's Bronze Age, and according to Chinese tradition, the Xia Dynasty. Chinese scholars generally believe that this type of habitat has developed mainly from the Han dynasty (206 BC to 220 AD), along with a progressive improvement of construction techniques to the dynasties Sui (581 to 618) and Tang (618 to 907). But it is during the dynasties Ming (1368 to 1644) and Qing (1644 to 1912) that the pace of construction reached its peak. The yaodong homes are common on the Loess Plateau of China in the North and are found mainly in four provinces: Gansu, Shanxi, Henan, and the Hui Autonomous Region of Ningxia. In the Qingyang region especially, the ratio of cave dwellers to non-cave dwellers is the highest found anywhere in China. More elaborate yaodongs may have a façade built with stones with fine patterns carved on the surface. Yaodongs can also be constructed with stones or bricks as stand-alone structures. The inside walls are usually plastered with lime to make them white. The construction processes of different types of yaodong are slightly different. For the cliffside yaodong, the main structure of it is the soil wall, and the interior is reinforced with wooden piles. In addition, the beams and columns bear the load, forming a structure that guarantee the cave will not collapse. The common method of this construction process is to use rock as wall base and the clay as the top tile. In order to reinforce the cave and reduce costs, the wall is made of clay inside and stones outside. Building a hoop yaodong needs wood frame mold for building construction. Because the wood mold can be reused and the wood consumed is limited, the overall cost can be lower than that of most housing. Moreover, because its space volume is 1/3 smaller than that of a regular house, the hoop yaodong has a strong advantage in energy conservation. The first step in the construction of a hoop yaodong is to dig the foundation after determining the orientation. Then, the entrance position and the height and thickness of the wall is determined based on the orientation. A hoop yaodong usually has three or five caves. The second step is to excavate the cave. Because a hoop yaodong is built on the flat ground, the excavation only uses the existing brick wall to make the arch structure, forming the basic spatial form of each cave. The yaodong is covered with at least two meters of soil mud to ensure the thermal insulation of the cave. Based on the main body of the yaodong, the top of the cave should be covered with a normal house and capped. The third step is to build the fence and install doors. The most famous yaodongs in China are perhaps those in Yan'an. The communists led by Mao Zedong headquartered there in 1935–1948 and lived in yaodongs. Edgar Snow visited Mao and his party in Yan'an and wrote Red Star Over China. ^ Ivana (2003). "Ancient underground courtyards sinking out of sight". www.chinaculture.org. P.R.China: Ministry of Culture. Archived from the original on 2011-09-28. ^ "Xiachenshi huangtu yaodong minju yuan luo chuyi" [A preliminary discussion of sunken loess land cave dwellers' courtyards]. Architects (Jian-zhushi) (in Chinese). 15: 75–82. 1983. ^ "Advantages and Disadvantages of Earth-Sheltered Homes". U.S. Department of Energy. 2011. Retrieved 2011-09-28. ^ Knapp, Ronald (July 1992). Chinese Landscapes: The Village As Place. Honolulu: University of Hawaii Press. pp. 151–160. ISBN 978-0824814137. ^ Wang, Guorong (2011). "Xibei yaodong minju leixing ji kongjian jianxi". Journal of Lanzhou University of Technology. ^ wang, hui (2013). Yaodong dikengyuan yingzao jiyi. China: Anhui Science and Technology Press. ^ Wang, Fang; Yu, Fengyao; Zhu, Xiaohua; Pan, Xiaoli; Sun, Ruimin; Cai, Hongru (2016-10-01). "Disappearing gradually and unconsciously in rural China: Research on the sunken courtyard and the reasons for change in Shanxian County, Henan Province". Journal of Rural Studies. Rural Restructuring in China. 47 (Part B): 630–649. doi:10.1016/j.jrurstud.2016.05.011. ^ Golany, Gideon (1992). Chinese Earth-Sheltered Dwellings: Indigenous Lessons for Modern Urban Design. Honolulu, HI: University of Hawaii Press. ^ Gale Eaton (23 October 2015). A History of Civilization in 50 Disasters (History in 50). Tilbury House Publishers. p. 65. ISBN 978-0-88448-407-3. ^ a b "Qianxi Shanbei Yaodong jianzao gongyi he tezheng". Journal of Yanan University (Natural Science Edition). 2014. Golany, Gideon S. Chinese Earth-Sheltered Dwellings. Honolulu: University of Hawaii, Press, 1992. Wikimedia Commons has media related to Cave dwellings.